Chocolate and seaweed sounds like a strange combination, but it works famously in this gluten-free, salt-free shortbread. Together, chocolate and seaweed almost taste like molasses. I was on a roll last week and tried my hand at making three different types of shortbread. This particular recipe, which came about on an unexpected whim, turned out being my favorite. I also made a batch using spelt flour (not gluten-free) and another using buckwheat but no seaweed. All three versions turned out well. Use spelt if you want slightly sturdier cookies that won’t crumble so easily. 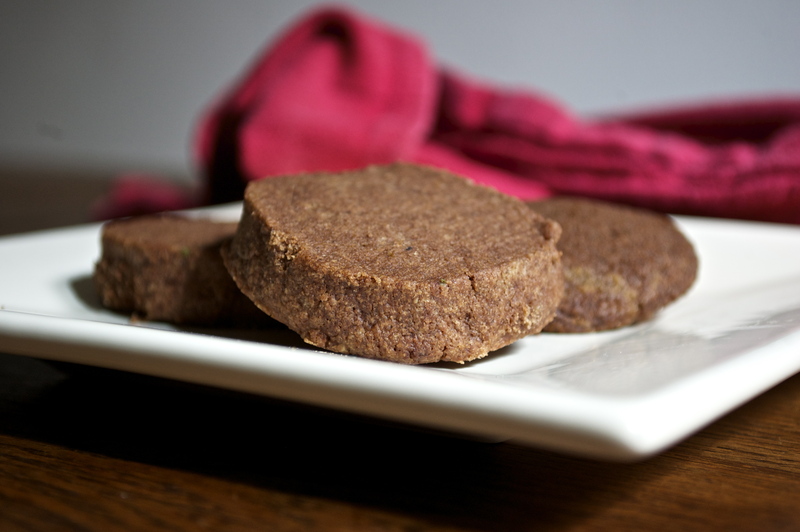 The buckwheat shortbread is a bit fragile and may break in your hands, especially when just out of the oven. The spelt cookies are still light and airy, and have a slightly nutty flavor. Seaweed got involved when I was trying to think up a way of adding a little salty flavor to my buckwheat shortbread. I spotted a jar of seaweed flakes in the cupboard and thought, “Why not?” What I had on hand was a colorful combination of sea lettuce, dulse, and nori. I’d found it at the health-food store one day and had used it to season cold salads and My Buddha Bowl, but hadn’t yet used it in baking. I mixed the flakes into the dough, and then sprinkled some on the outside edges of the cookies just before baking. Unfortunately, my photo doesn’t show these ones, as they disappeared to quickly! 1. With an electric beater, combine butter and sugar. 2. Add flour, cocoa powder and seaweed flakes. 3. Divide batter in two and roll into logs (the circumference should be the size cookies you want). 4. Wrap in plastic film and put in fridge for 1 hour. 5. Cut logs into disks (about 1/2 inch thick) and place cookies on a baking sheet. 6. Sprinkle the edges with seaweed flakes. 7. Bake at 180°C / 350°F for 10-12 minutes. 8. Let cool before removing from baking sheet. This entry was posted in Recipes (All), Recipes (Gluten-free) and tagged chocolate, dessert, salads, spices. Bookmark the permalink.